I just brought my 2000 GMC 3500 Blue Bird home. On the way, I kept having issues with the battery draining even after replacing it. I installed a lever switch so that I can disconnect the battery while I'm not driving to make sure there's no drain. However, I need to find a solution to this problem. I'm a single woman and getting out and popping the hood every time I get somewhere is not safe. Not to mention if I were to forget & be stranded with a dead battery. I don't have a good idea of what's going on. My brake lights & turn signals in the back all have to be replaced because a few of them are holding water. The rest only 10% of the LEDs work. I've bought all the lights ($300 later) but haven't installed them yet. I'm wondering if this may solve the problem? I don't know anything about electrics but I do know that my wires are a MESS. I don't even know where to start to get everything cleaned up. It gives me a load of anxiety just looking at all the craziness. Another quick thing, my bus still has the little computer that used to sit on the arm to open the double doors. The man who sold it to me took out that arm but left the computer. When I bought it, he told me it may be worth some money. Do you guys know anything about this? and if it is worth something, how the heck do I disconnect it? There are so many wires. New lights should solve the water retention and LED's not working but I doubt it will solve whatever is draining the battery. The lights should be easy enough to replace. They may be hard-wired in or they may be plug-and-play. Color-code the wires. White to ground (attached to body usually), black to running lights, red to brake or turn signal, as appropriate. Not sure what the computer is you are referring to. Post a photo if you can. A picture is worth a thousand words. Could be any number of things. Electrical systems may seem complicated but go one step at a time. Disconnect one wire, see if the bus still starts/runs. If it stops doing that, then you've disconnected something important, plug it back in. Try to not cut wires whenever possible, but simply detach them as neatly as you can. *HELPFUL HINT* some wires are live all the time, and you don't want to short out anything when removing them, if there's a chance your wrench may do that, disconnect the associated fuse or battery to eliminate that possibility. Don't be surprised if your new lights stay on when they're not supposed to - it is *NOT* the new light's fault! Something, somewhere, is on when it isn't supposed to be - brake light switches do wear out and remain in the "on" position sometimes, or simply get out of adjustment. You may have separate headlight and clearance light switches (my IH/BlueBird has this). Make sure both are off. Send more photos if you can, we'll see what we can troubleshoot from here. Among other things, you can use the multimeter to test for voltage between any terminal and ground to see if current is flowing when the bus is off. I'll admit I haven't looked at the electrical system on a Type A bus but if you can add some photos that would help a lot. In other bus types there is am electrical panel accessible from outside the bus and a "master switch" solenoid that engages when the key is turned on, which means if you test the solenoid you can mark everything on the other side of it as being good. This puts your potential power drain on things that branch off before the solenoid, which should be a much shorter list. Thank you! This is all good stuff. I got together some pictures for you. Have you got a pic of that battery lever switch you spoke of? Did a garage install it? Your lights should be taken apart and inspected. That will let you see why water got into them. Just do one at a a time and post your findings with or without pics, the sockets may be salvageable. Might need new gaskets or caulking to seal them better. One pic you posted with the connections showing, what is that and where is it located. Don't know your bus so is a mystery to me. 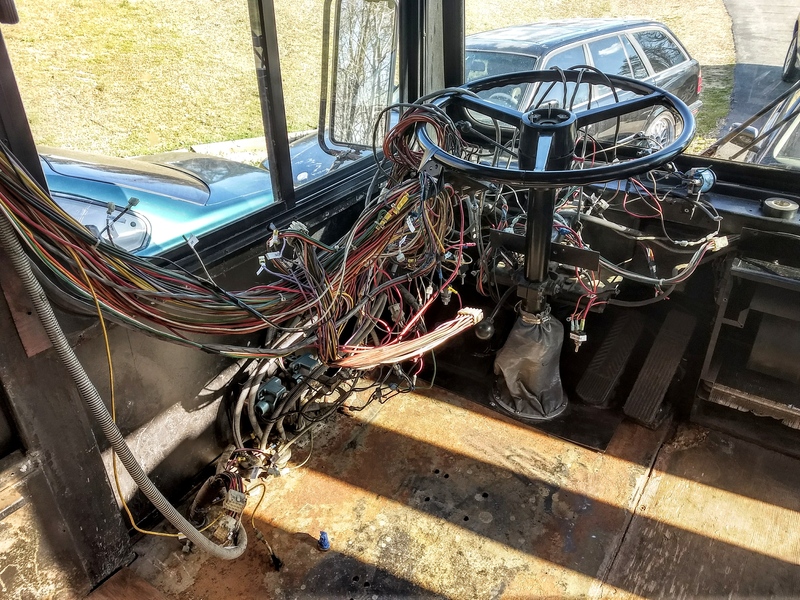 Most of our buses have messy wiring to some extent but doesn't mean it's a mess or bad. With troubleshooting, one has to open the wire bundles to trace a wire from end to end. Often they don't get re-bundled neatly as other issues seem to appear from time to time. You can sort yours out but understand how overwhelming it might seem now. Build up your tool list if you are going to own a bus unless money is no object. Lots of knowledge on this site so just ask and somebody likely can help you. Another suggestion - don't replace your turn signal bulbs with LED without replacing the turn signal relay. They don't draw enough power so the regular relay will blink very fast. In the picture of the two relays with the third one missing and a yellow jumper in its place does not look right . Just guessing the relay went bad and they removed it and jumped the coil power feed right to the clearance lites with the yellow jumper. Is there switch for your clearance lights? This may not have anything to do with your ghost load problem but it does not look right to me. Although I am rooting for you, I am troubled that in your world a box with a couple of switches and a light is considered a "computer". Godspeed to you Grace.